If you’ve been waiting for the right sale before you make the jump from sort-of-wireless earbuds to truly wireless earbuds, today is the day you’ve been waiting for. 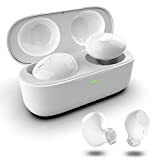 MJYUN Truly Wireless Earbuds have a solid 4.4-star rating on Amazon, and they’re always affordable at just $40. But if you use the coupon code FIOHWAYC at checkout today on Amazon, you’ll score a pair for just $31.99. Definitely grab a pair while they’re still in stock. No Wires. No Hassle – Get total hands-free with these mini earbuds to enjoy Hi-Fi music during your workout, sporting or driving. Ultimate total-wireless earphones with brilliant audio quality. Stable Connectivity, Advanced Audio Quality – With the Bluetooth V4.2, high quality chip, advanced audio technology for stereo bass sound and use built-in A2DP /AVRCP audio processing system for noise deduction. You can have unbelievable dynamic sound throughout your workout. Long Playtime and Easy Setup – Wireless headphones allow 2 hours music time of a single charge, up to 5 hours’ premium quality Talk/Play Time, and up to 80 hours’ standby time (full charge approximately 1-2 hours). The portable 500mAh capacity charging case can recharge on the go up to 4 times to earbuds, no cable needed. Upgraded paring system effortlessly pairs one earbud with the other automatically synchronizes in seconds. Supreme Comfort and Fit – Ultra mini size in-ear earbuds are sleek and lightweight, ergonomically designed to stay comfortably and stably in your ears. The custom-made silicon caps keeps comfort during your workout. Reliable After-sale Warranty – Our total wireless headphones have 12-month free warranty. Please feel free to reach us for customer support if you’re not satisfied with the purchase.